National Committee in Library and Information Services. 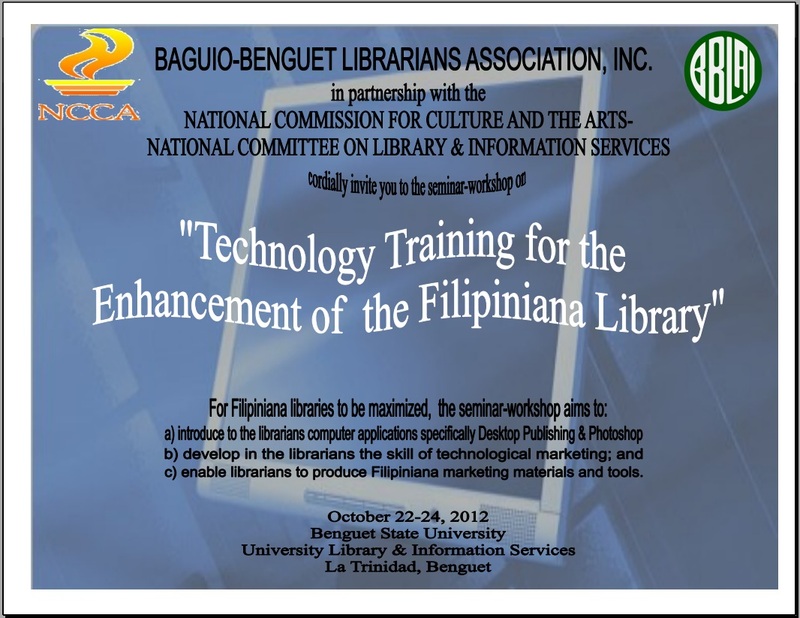 In reference with the survey conducted last August on your Filipiniana librarian and collection, Baguio-Benguet Librarians Association, Inc as the implementer of the National Commission for the Culture and the Arts-National Committee on Library And Information Services project on Capability and Training for Librarians and Information Professionals will be offering a seminar-workshop on October 22-24 AM, 2012. 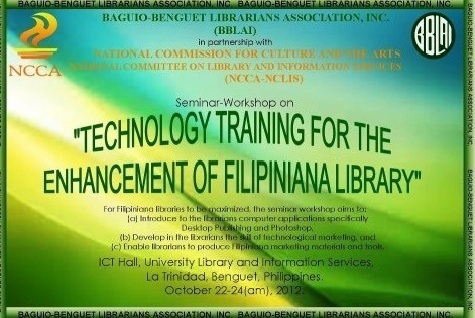 3) Enable librarians to market Filipiniana materials. 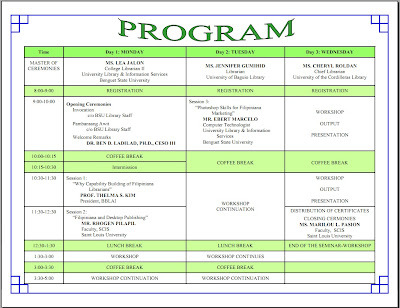 The seminar-workshop is free inclusive of registration and lodging. 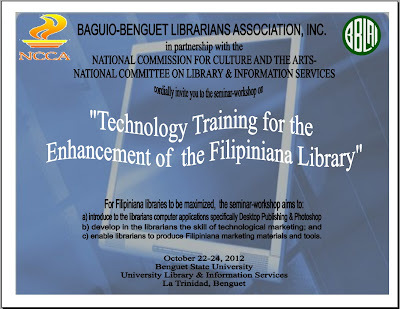 Thus to accommodate librarians in Luzon area only one (1) librarian per institution is encouraged. Please bring a laptop if you have. 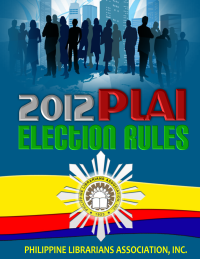 You can register online http://fs25.formsite.com/baguiobornlibrarian/registrationform/index.html on or before October 19, 2012. Early check-in starts October 21 (Sunday) at 2PM, check-out is October 24 at 12noon. 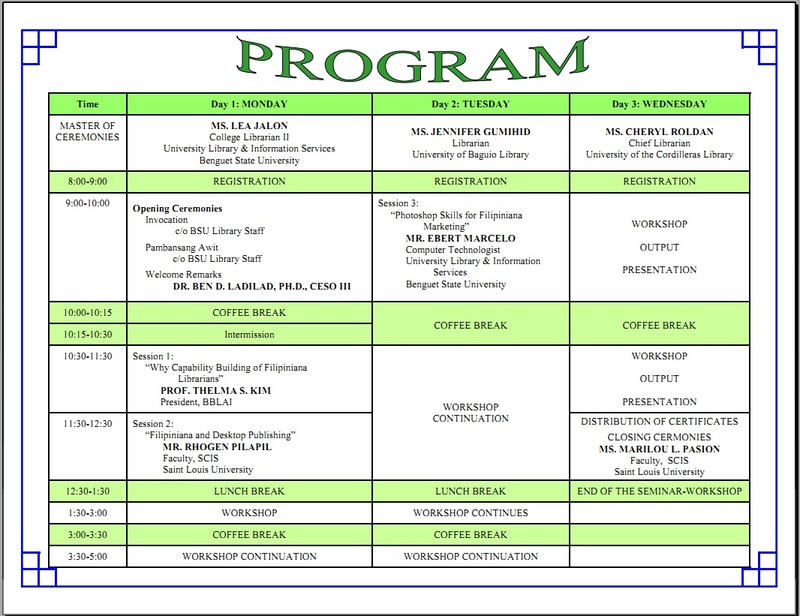 Attached is the program for your perusal. Contact the following for more details: Amy Cendana - amelia_cendana@... / +639153568316, Malou Pasion - malousyat@... / +639272396232, or Cheryl Roldan - cherylroldan@... / +6309328832678.